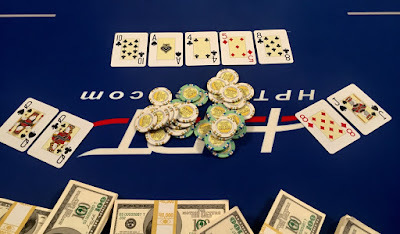 Heads up play enters it's third hour of competition between Matt Bond and Mike Englert for the @HPTPoker @Gates_Poker title. Bond announces he's all in on the flop and Englert calls .. Both players have a pair and Englert barely has Bond covered. The stacks are so close that this outcomes is definitely going to determine a winner. The board runs out and Bond is eliminated in 2nd place, cashing for $124,028.